I stop by frequently and don't expect too much... but this day, this day would be different. As I drove into the parking lot of the Thrift Store, it was clear that no new "steel steeds" had been added to the herd. I began to drive off, but then thought otherwise. Maybe just a quick look around the shop - you never know what you might find. I found nothing, but to my surprise, as I walked out the door to the car and glanced at the bike rack, two new additions had found their way into the rack along with the reject kids bikes. One was a no-name mountain bike. 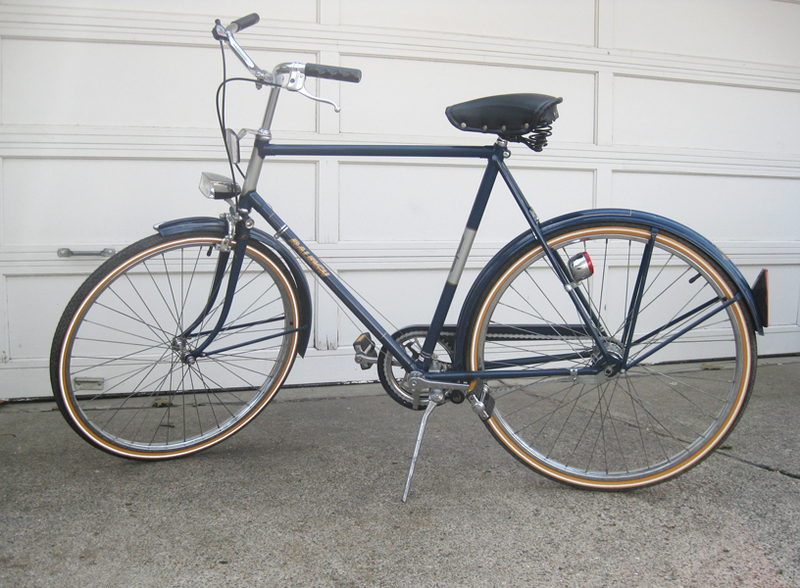 The other, a beautiful root beer brown Raleigh Sport with a step through frame. She looked a bit like a coal miner's daughter - a little dirty around the edges. Had a wet , dirty wool saddle cover. Both tyres (yes, tyres. It is a British bike after all!) were flat. But as a man who appreciates beauty that's not skin deep, I could tell she'd clean up to be a real keeper. I walked back into the shop and found the youngest volunteer I could come across. "How much for that bike you guys just tossed out there?" I asked, trying to temper my enthusiasm. "Well, I'm not really the bike person... um... I don't know, how about thirty dollars" she said. "Just tell them at the counter." OK, I have 17 bikes right now... but this is too good a deal to pass up. My wife would look so sweet on this bike. She is British after all. So I snagged this little honey and got her home to the shop. Some preliminary work on the web dated it. According to Sheldon Brown's site, this is a 1980 Lady's (Canada). The give away for me was the comment "Chainguard encircles chainring, bolted to tapped hole under bottom bracket." As you can see, this is the case here. Most Raleighs of this era are fitted with the "hockey stick" chainguard. Once I got her home and removed the woolly saddle cover, I was at first disappointed to find the Brooks "mattress saddle." But the disappointment faded quickly when I looked the saddle over and found it in almost perfect condition! Rare for a bike this age to have a vinyl saddle in this nice of shape. The woolly saddle cover actually cleaned up very nicely and is very usable for those inclined to use a woolly saddle cover. It also sports the original vinyl saddle bag. The leather straps that hold the bag to the seat post were a bit broken, but I did my best to glue them back together. I may try and have this part fabricated - or just use a wire tie. What more is there to say... a couple drops of 10-30 in the Sturmey Archer hub (it is a hub with a coaster brake), a nice wash down with warm soap and water, a light coat of Turtle wax and some steel wool to the rims and this bicycle looks and rides like new. Well, this bike has long seen another rider after being sold to a friends friend about a year ago... 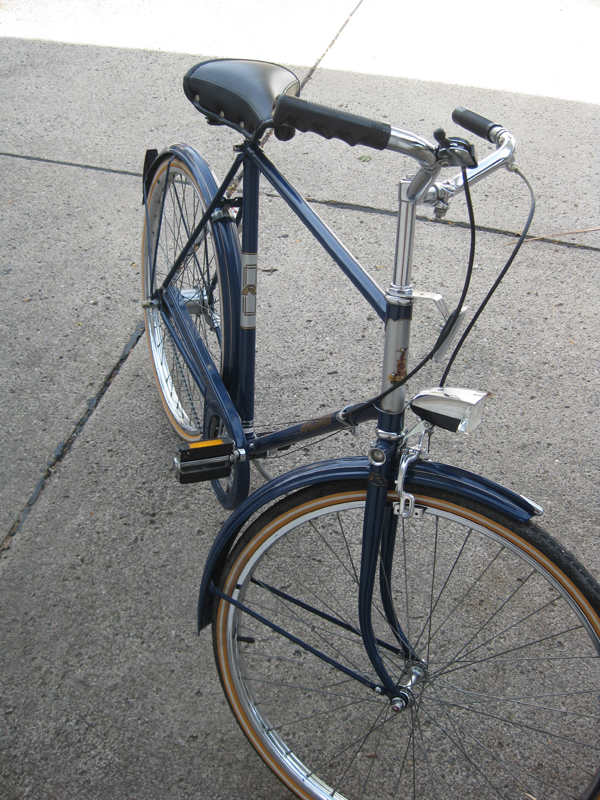 But I just needed to post up pictures of my friend Becca's gorgeous blue 1980 Raleigh Sport Lady's Gent's Canada. Becca, thanks for sending them along! It looks like it was a fabulous project. Here is a nice shot from the back, Becca tells me that is a new old stock mattress saddle, just like the originals. I love the large vertical reflector on the fender. 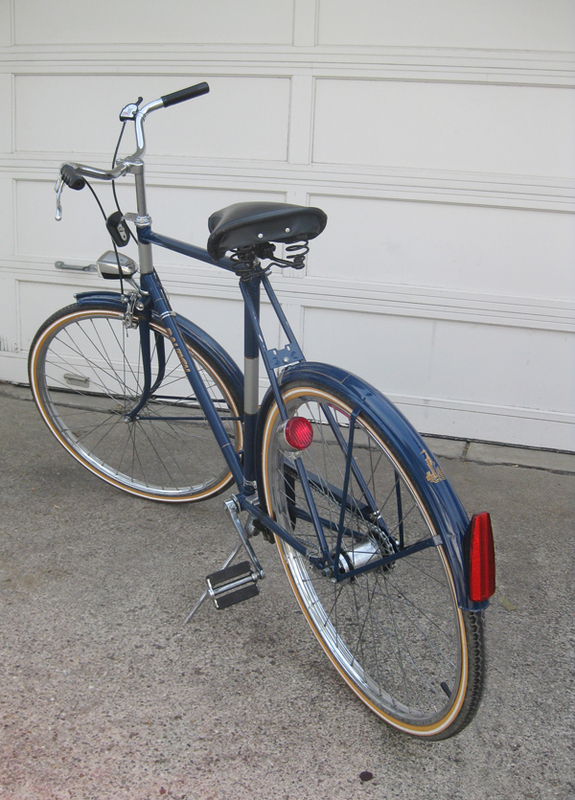 This is a 3-speed coaster brake, so only a single brake caliper and lever needed for the front. The headlight and tail light look to be battery operated rather than hub or dynamo driven. Overall, spectacular rebuild. Becca, you've done a nice job on this one! not crazy, that's beautiful!!! and what a DEAL! i came across your post trying to find out what the original saddle was on these bikes. 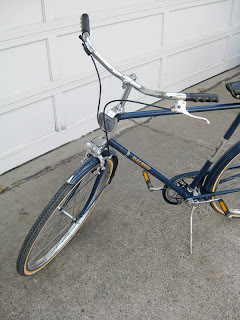 i just bought a 1980 men's version of this bike. it's a dark blue. 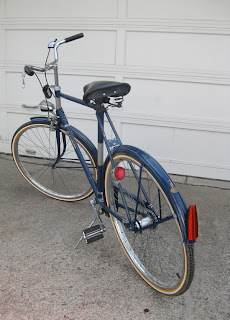 looks just like this one, but it has generator powered lights on the front and back -- that still work! i'm am GIDDY, i'm so excited about this bike! i paid a lot more than you ($175), but it was worth it. Congratulations on your new bike! I don't think you overpaid at all, especially with the working electric systems. Those alone are worth a LOT on eBay. I have a DL-1 Tourist with the Dynohub on the front. It took me forever to find a working light set and wire harness. I bet the dark blue is gorgeous. Do you have a blog or pictures you can share? I'd love to see it. I wish I still had this bike. I sold it to a friend of mine here is Seattle. My wife is NOT really a cyclist and wanted more "speeds" than the three. As far as I could find, 1980 was the only year they made the unique chain guard with a full circle on the front. Nice find! well, it took me awhile, but i finally got the old Sport a new mattress saddle and grips that look close to what came on it originally, plus new tires and i got it detailed and polished!